Mix 1 tbsp of the sugra with 1 tbsp of the oats and set aside. Do not over mix. Fold in only until the fruit is mixed through the batter. 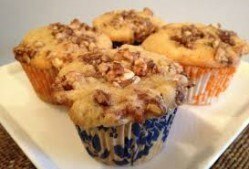 Spoon into greased or paper-lined muffin tins.Top with sugar and oat mix. Bake at 350 degrees F for 25 minutes or until a toothpick inserted in the center comes out clean. Best served warm. Previous Post The food was amazing… Next Post I Am Still In Awe!